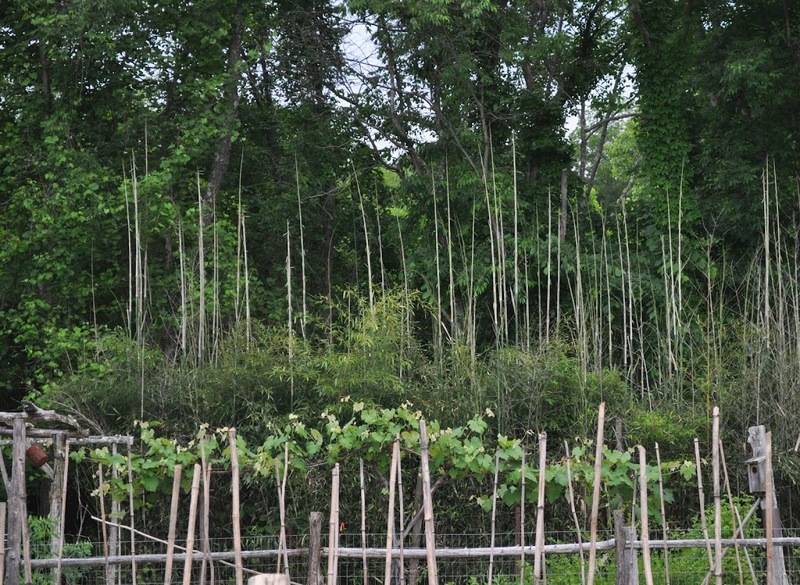 Yellow grove bamboo (Phyllostachys aureosulcata) is among the hardiest of the “timber” bamboos. Within a half-hour’s drive from here, into cold hardiness Zone 6, this species grows over 20 feet tall, with 2-inch-thick canes. In this cold spot where I live, yellow grove bamboo grows only about 15 feet high, with canes just a little more than an inch across — nice, but not quite as “mysterious” or “foresty” as I had hoped. 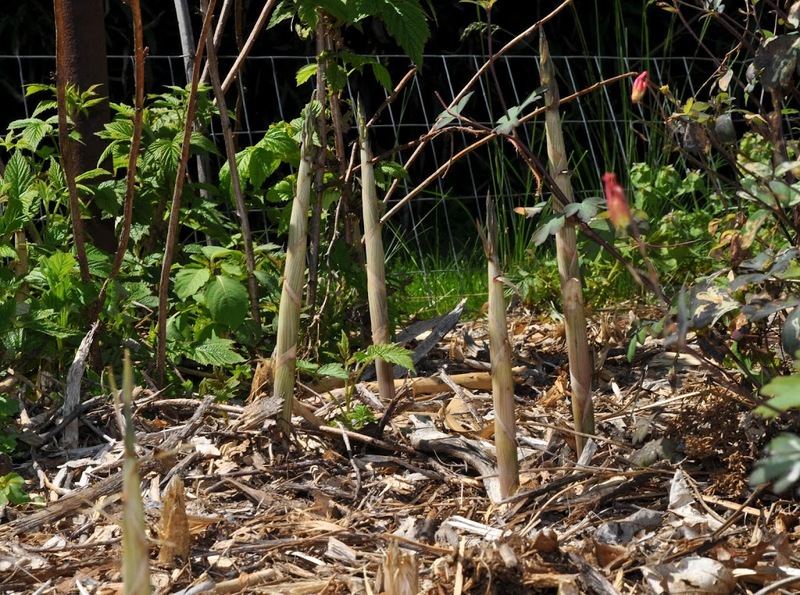 Except for recent winters, the canes of my planting have always died back to the ground so that each year the plant had to grow all new canes, something it does with much enthusiasm. I’ve measured 6 inches of growth per day for the month or so it elongates in spring! In recent winters, my planting has held its green leaves all through winter, just like plants further south. The result is thicker and longer canes. That extra energy saved also infuses the whole planting with even more vigor — and that is what incites terror. I had the foresight 20 years ago to hem in most of my planting with an impenetrable barrier to stop the future spread of the roots. The thick plastic barrier reaches down a couple of feet deep into the ground and is usually used to prevent tree roots from creeping beneath and heaving up nearby sidewalks. I lacked the foresight 20 years ago to appreciate how relentlessly the roots would seek escape from said barrier. Some roots evidently briefly braved sunshine long enough to hop over the lip and then dive back into the ground, reappearing across an 8 foot strip of mown grass in among some raspberry and gooseberry plants. My plan for the latter escapees is to cut down shoots as relentlessly as they appear, and eat them. And then, close inspection of the barrier and severing of errant escapees right there should starve out the root network that has entered the garden. I never put a barrier to the rear of my planting. There, woods have pretty much kept the spread of bamboo roots in check. But with warmer winters, less so in recent years. I just don’t get all the hubbub about garlic. 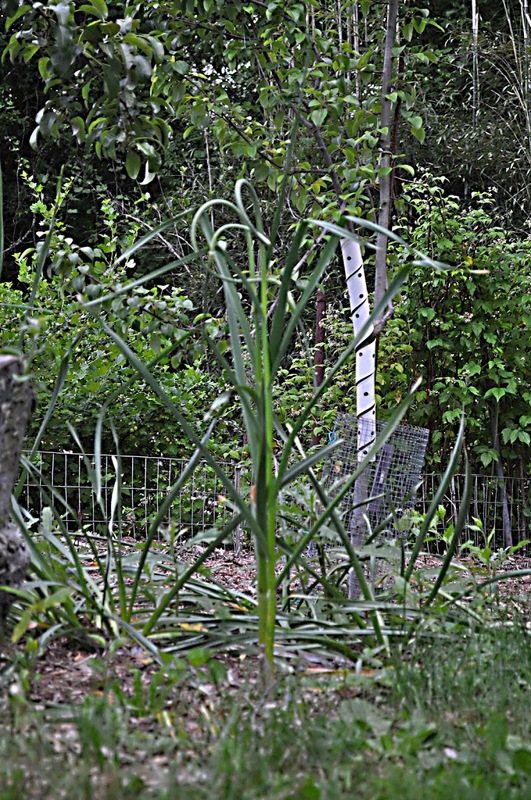 I was recently looking at a friend’s very small vegetable garden, almost half of which was devoted to garlic. It’s not that garlic tastes bad (although in the past it was used more as medicine or for warding off witches than for eating). It’s just that the area devoted to garlic could have been devoted to asparagus, tomatoes, lettuce, or beans. Even small fruit bushes, such as gooseberries, currants, or blueberries could have used that real estate instead. I’d choose any of these vegetables or berries over garlic (for eating, not sorcery). Home-grown asparagus, tomatoes, lettuce, or beans taste vastly better than what you can buy. Same goes for the berries, and you can’t usually even buy gooseberries or currants, especially of the better varieties. Garlic from a store or farmer’s market tastes as good as what you can grow, and fresh-picked is not a consideration for this storage bulb. I grow garlic as an afterthought in out of the way places. It does get its needed full sunlight and rich soil, though. In fact, around here, I spend more time weeding out garlic than planting it. Clumps sprout in my flower beds, in amongst my berry bushes, and at the base of a rose bush. Garlic does not make seeds so I can’t imagine how it gets to all these places. I’m glad that the one place where it does not appear spontaneously is in my vegetable garden. This entry was posted in Uncategorized and tagged garlic volunteers, Phyllostachys aureosulcata, yellow grove bamboo. Bookmark the permalink. Trackbacks are closed, but you can post a comment. I grow the same bamboo, with similar results, even though I’m 6b. I’ve found that thick young poles split lengthwise bend enough to make excellent row cover hoops, and loosely woven, the poles make very attractive moveable fence panels. I couldn’t disagree more about the garlic, though. I’ve found a lovely, mild yet flavorful variety that is much better than what I can find in stores, and the garlic braids are beautiful. My daughter likes to keep one in her kitchen for show – but ultimately can’t resist using it. Garlic is wonderful fresh (immature – looks kind of like scallions) and the scapes are excellent too. No, I didn’t soak the rice first. That’s probably why germination was so poor. My rice “field”, planted out yesterday, consists of 16 plants. I grow the same bamboo with similar results, even though I’m 6b. I’ve found that split, thick young poles bend enough to make excellent hoops for row covers, and loosely woven the poles make lovely moveable fence panels. And they’re so light! I disagree about the garlic, though. I’ve found a mild but tasty variety that is much better than I can find in stores. We also enjoy it scallion size and the scapes are delicious. Its no trouble to grow, and we eat a lot. The braids are beautiful; my daughter keeps one on display in her kitchen to impress her foodie friends.